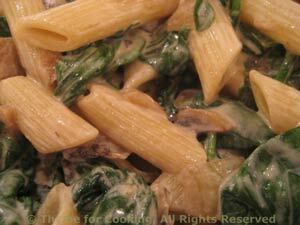 Pasta with Fresh Spinach, Sautéed Mushrooms and Goat Cheese. A little goat cheese brings the mushrooms and spinach together for this simple, healthy side dish. Wash spinach (if necessary) and roughly chop. Heat oil in medium nonstick skillet over medium heat. Add onions, garlic, mushrooms and sauté for 10 minutes, until lightly browned. Add spinach and stir-fry until spinach is just wilted, 1 - 2 minutes. Add goat cheese and stir until it melts. Stir in soy sauce and yogurt. Toss with pasta and serve immediately.